Here’s a clip from First Peoples, a 2015 PBS series about the prehistory of the human race. This clip features archaeologist (and Ronin Institute Research Scholar) Jeff Rose talking about his field work in Oman and the very earliest expansion of anatomically modern humans into the Arabian Peninsula, the first step out of Africa in our rapid expansion around the globe. Check it out! Ronin Institute Research Scholars Ruth Duerr and Soren Scott were honored last week by the Federation of Earth Science Information Partners (ESIP) at the Federation’s January 2016 meeting. 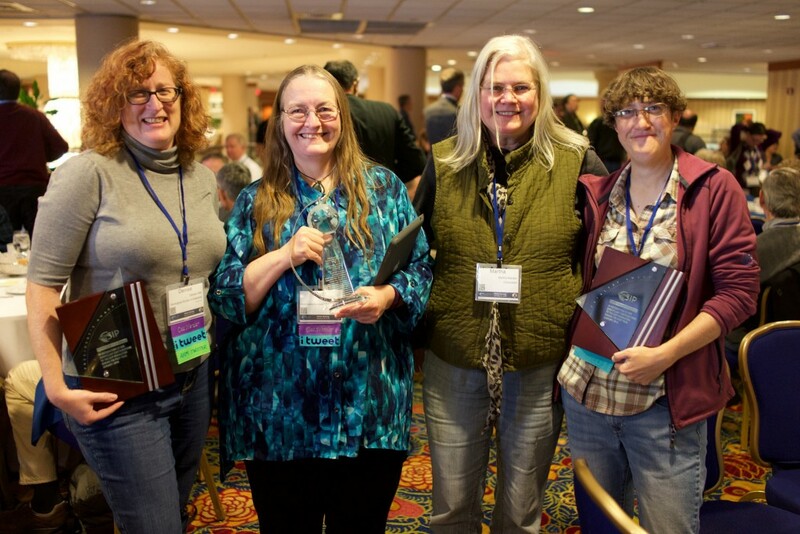 ESIP Awardees, featuring Ruth Duerr (second from left) and Soren Scott (far right). Photo by Bruce Caron. Headlining the awards ceremony was Ruth Duerr’s receipt of the Martha Maiden Lifetime Achievement Award for Service to the Earth Science Information Community, which recognizes “individuals who have demonstrated leadership, dedication and a collaborative spirit in advancing the field of Earth Science information”. Ruth has held numerous leadership positions within ESIP, where she has been a consistent champion of data accessibility and stewardship. The nominating committee noted that “Ruth’s dedication to the principles of Earth science information access and sharing are exemplified by her service as an ESIP liaison on many community initiatives, both nationally and internationally, that have led to improvements in capabilities and understanding of the issues necessary to facilitate access to and sharing of Earth science information”. Soren Scott received the ESIP Catalyst Award, which “honors those who have brought about positive change in ESIP and inspired others to take action”. Current ESIP President Peter Fox noted that Soren “was able to make stagnant and dormant ESIP initiatives become active again in a very short period of time”. Congratulations to both Ruth and Soren for this well deserved recognition!